The Silver Butte Mineral property is a large gold and silver mining property with extensive deposits of gold and silver. The mine contains over 2 miles of development with 7 adits and two vertical shafts. The shaft on the Wild Goose Vein is 600’ deep and the shaft on the Bullion vein is 400’ deep. The deposit is an epithermal Comstock deposit containing Silver, Gold and Copper. There are 4 viable veins defined on the property, the Wild Goose, The White Swan, The Paradise and the Bullion. The veins range from 1 foot wide up to 25 feet wide on the Bullion vein. 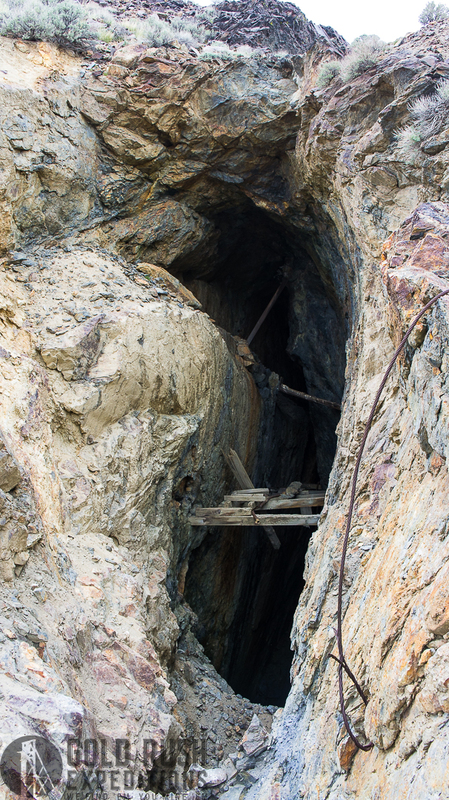 The mine is cut on a steep canyon wall and for this reason, many of the workings are interconnected. In cases of shafts, such as the one sunk on the Wild Goose vein, the 600’ depth is deceiving as it can be accessed from lower in the canyon via a haulage tunnel near the base of the canyon. The workings are substantial and give some hint of the values that the mine has produced and still has in reserve. Gold and silver are the primary. Good 4WD access to the lower haulage portal. Hike in access to the other portals. 4WD access to old mill side and upper portals. 50 miles to Winnemucca, NV. The site contains two mill sites, the first mill was utilized in the initial development of the project in 1879. The second mill was erected in 1931 and some remnants are still visible. The mine and region was large enough for a small city to develop in the late 1800s, known as Spring City, there are still some remnants of the town in the low canyon. A recent fire (2017) destroyed all wood and structures which could be burned. There are no defined reserves, but correspondence from various mining engineers from 1939-1960 state that there is substantial ore to be recovered. The operation in 1931 was developed to process the waste dumps and was woefully short in production despite much correspondence from mining engineers to the owners of the property advising the removal of ore from underground. Surveyors noted deposits of gold and silver in the workings of the mine on all levels with many stopes appearing to only be lightly worked. There is excellent access to the site via existing county roads. High clearance 4WD is required for some wash crossings and steep and loose inclines. The Silver Butte Mineral Property is a large gold and silver mining property with extensive deposits of gold and silver. The mine contains over 2 miles of development with 7 adits adn two vertical shafts. Contact Jason with questions or for more information.